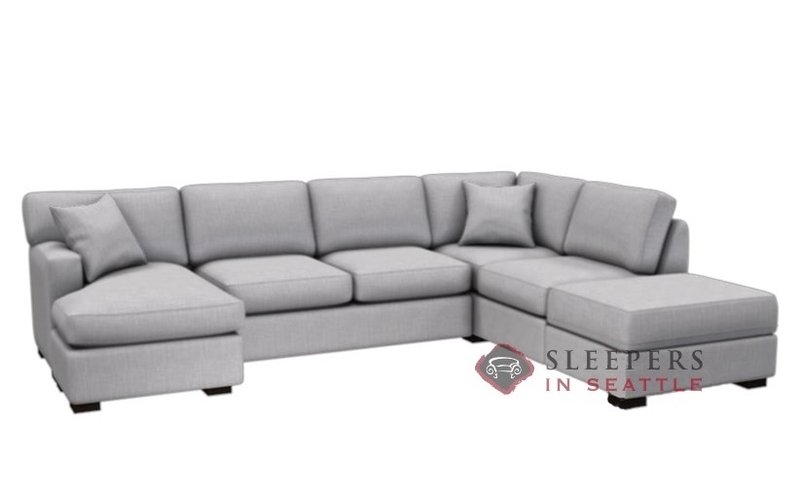 The 146 Dual Chaise Queen Sectional Sleeper takes a simplistic approach to smart design, and is made from the highest quality materials to come in at a very strong value. 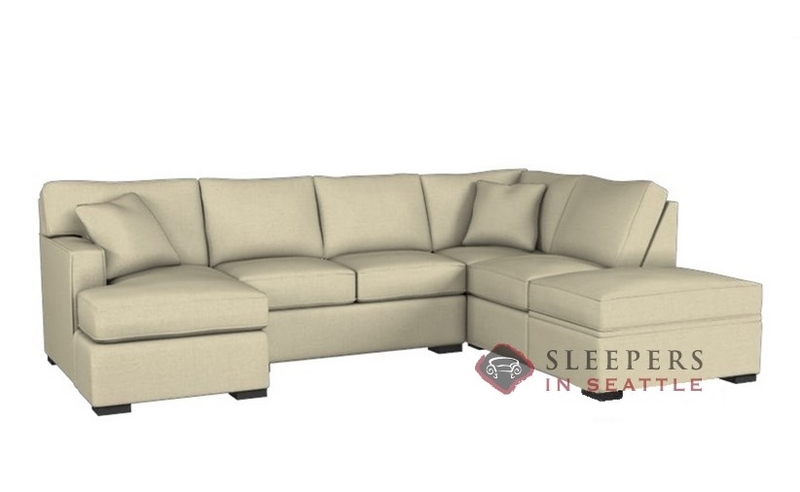 This model is made in Oregon, from wood and natural materials found in the Pacific Northwest, and ships nationwide absolutely free. Choose from a terrific selection of fabrics in our Sleeper Design Center today! This is the second Stanton I've purchased from Sleepers in Seattle. Obviously, I was satisfied the first time or I wouldn't have come back. 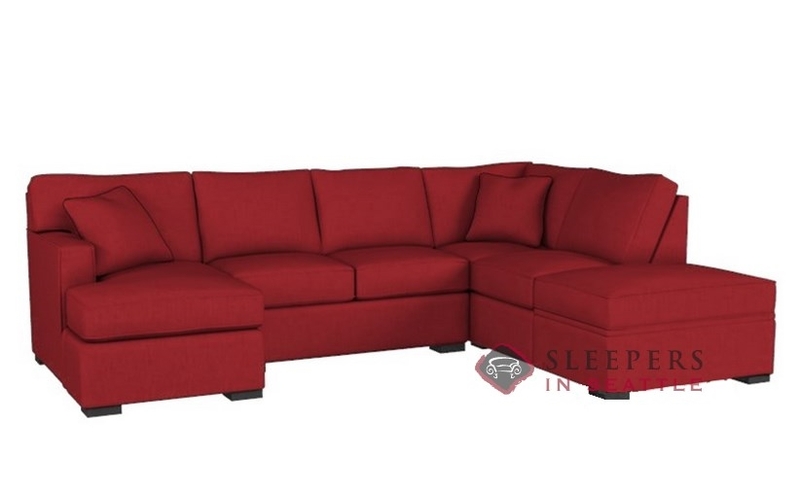 This is a great couch on its own merit, add in a queen size sleeper and storage space and it's really a great find. 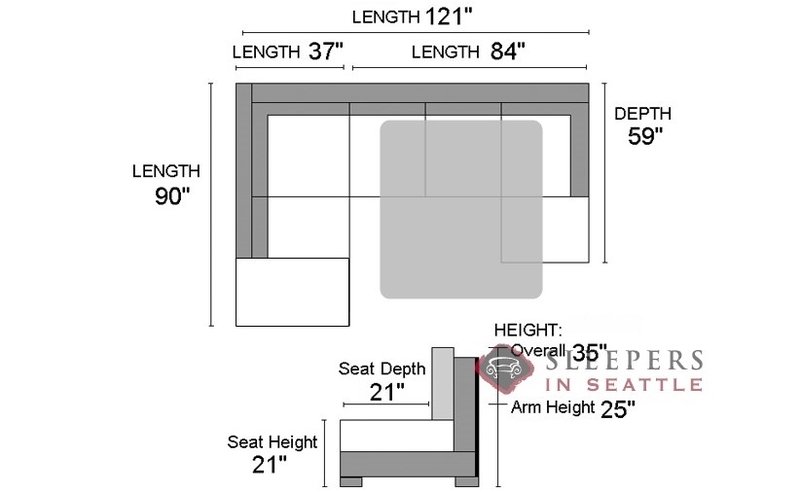 Do you have a schematic of how the bed pulls out for this piece? 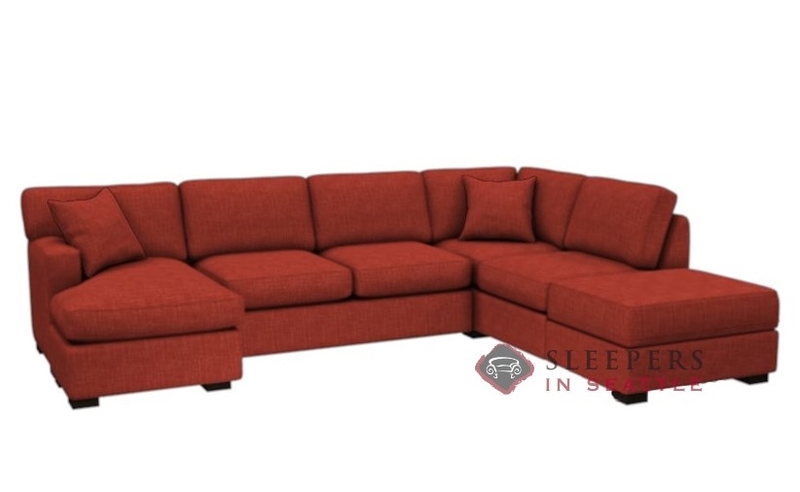 Are there multiple pieces - a cushion and its base, the couch, and the storage ottoman? There are two main components to this sectional, a one-arm queen sleeper with a chaise (the smaller chaise), and the adjacent long chaise. 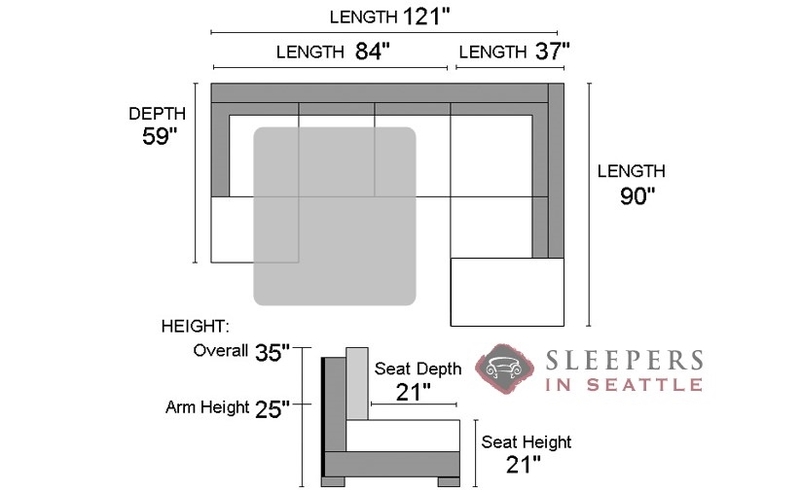 The base of the smaller chaise detaches from the sleeper component to move out of the way, in order to open the sleeper. 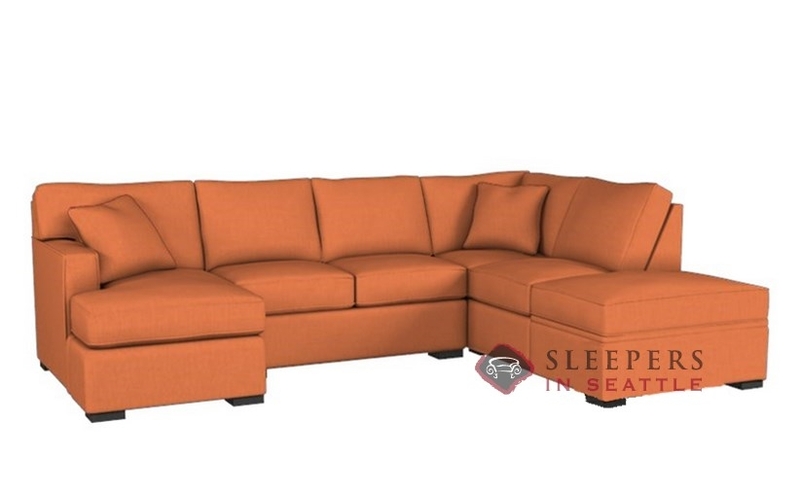 The larger chaise contains the storage compartment. All the cushions are separate. The sleeper opens with a premium version of a system you've likely seen before--with the canvas and bar. However, that bar has been lowered, and is quite simply no longer beneath the small of your back. Also, the included mattress is far above the quality of any sleeper mattress avaialble more than a few years ago, and there are upgrades available as well. Of course! 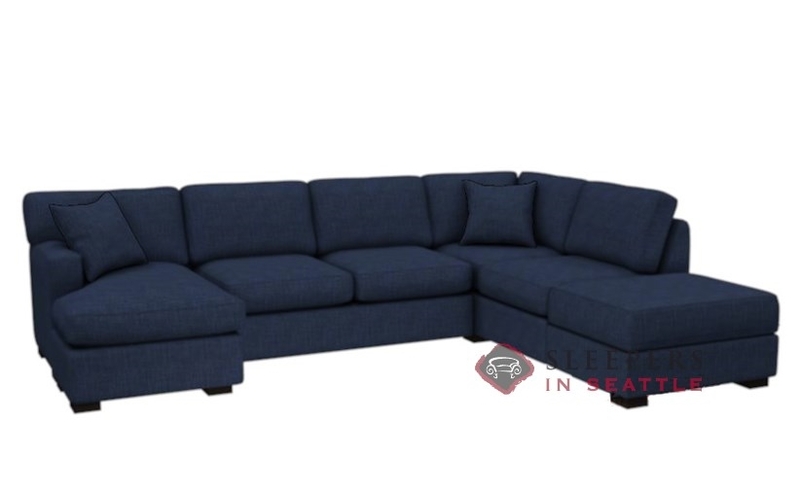 The fabric on the sectional pictured above is "Kendra Raven", which can be selected and ordered after clicking on "Start Customizing", above! Can the material for this couch be washable? W stands for a water-based cleaner; spot clean only with water or a water-based upholstery cleaner, shampoo or a mild detergent. S stands for a solvent-based cleaner; spot clean only with a water-free upholstery cleaner. W/S means you can use either a water or solvent-based cleaner. X means it should only be cleaned by vacuuming or by lightly brushing with a soft brush. Are both chaise sections detachable, or just the smaller one. In other words, can both be moved to different positions as desired? Only the smaller chaise is detachable, the larger chaise with storage end cannot be switched back and forth--but of course you can choose which configuration works best for your space prior to ordering. Does the upholstery come in a similar fabric to microsuede? There's so many fabrics to choose from and it's difficult to tell the difference between what each one would feel like. Any of the Stanton products do come in hundreds of fabrics, many of which are considered microfibers. If you select 'Microfibers' where it says Upholstery Tags in our Design Center, it will only display the options you're looking for. Some of the microfiber fabric groups include: Bella, Geo, Ace, and Champion.